Born and bred in Australia, Jono Hennessy has been producing handcrafted frames since 1925. Passionate about the items they produce, Jono combines superior comfort and fit with a unique style that reflects the company’s passion for individuality and creativity. Enthusiastic about making people feel fabulous and happy in their eyewear, Jono only produces 300 of each frame. 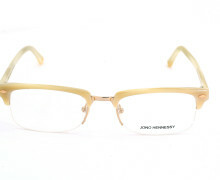 The Jono Hennessy 8089 is a vintage half rim frame with a twist. 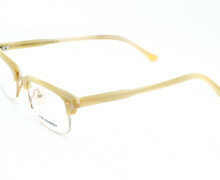 The bronze bridge and hinges are complimented by the cream and off-white mottled acetate arms and temporal width.